Alterna Hemp Volume Lock is Infused with ultra-hydrating hemp seed oil that protect and strengthen hair while addressing an array of styling needs. A maximum hold hairspray that gives incredable volume to the hair and locks styles into place. It ensures a firm yet touchable hold while adding exceptional fullness, manageability and shine. Benefits: Contains a dual polymer system which instantly delivers lift and body. Extremely fast drying. Creates extreme hold while adding volume. For use on all hair. Directions For Use: Style hair as desired. 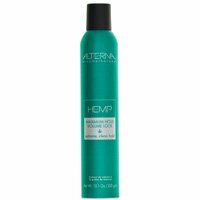 Hold Alterna's Hemp Seed Maximum Hold Volume Lock 8-12 inches from hair and spray.